Memory loss is something we all suffer from time to time. It can be everything from entertaining to life-threatening, but for most of us it’s usually just embarrassing — the times we can’t quite put the name with the face fast enough — or frustrating — Now what did I come into this room for? 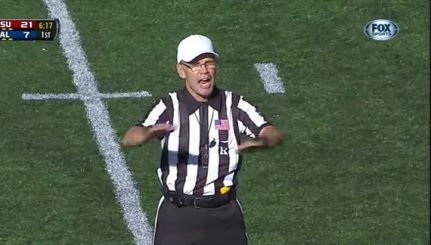 Here’s a guy we’d all like to forget. But when people actually have time to think things over and they just can’t seem to find the wherewithal to consider the obvious it is downright perplexing. Like Jameis Winston’s “coulda went either way” after a 59-20 shellacking in the Rose Bowl. Right. I guess we should just forget about those six turnovers that led to Oregon touchdowns. With a generous dose of selective memory (accidental or otherwise) we can convince ourselves of all kinds of things. But it’s just not a good idea to make decisions based upon what we choose to forget — and some of those forgotten things is the subject of this week’s Three-and-Out. 1. Eastern Washington football coach Beau Baldwin. 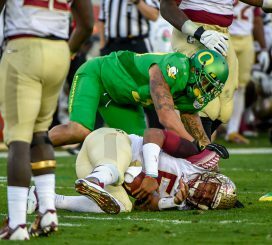 No coach likes to see his star player move to another team, especially the next team up on his schedule, so Beau was understandably not happy when quarterback Vernon Adams announced his intent to transfer to Oregon after completing his undergraduate degree, as allowed by NCAA rules. 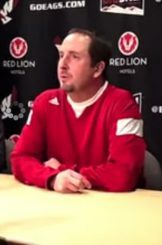 As quoted by the Spokesman Review’s John Blanchette, Beau said, “I don’t see myself finding my next quarterback at Linfield.” Linfield, it seems, plays a division lower than Eastern Washington, and I guess the idea was supposed to be that there should be at least some unwritten rule against dipping down to steal stars. Beau Baldwin says transfers to Big Sky good, from Big Sky evil. What Beau has — oops — forgotten is that while he hasn’t gone to Linfield to get a quarterback, he has taken a wide receiver from Whitworth, which is in the same conference as Linfield. Maybe I’m not seeing the right way to split hairs here, but perhaps he’s proposing an NCAA rule that says that it’s okay for wide receivers to transfer, but not quarterbacks? And apparently it’s also okay for players to transfer to Eastern from Pac-12 schools, since he has no less than seven former Pac-12 players on his roster. It’s apparently just not okay for players to transfer from the Big Sky to the Pac-12 — even after they’ve put in their four years and earned their degrees. The rule that allows players to transfer after achieving an undergraduate degree is a good rule, because it puts academics first. It accentuates the importance of getting that degree — which is a good thing to do considering the average NFL career is a mere 3.3 years long — and it provides the opportunity to pursue a graduate degree at a different university, which provides for a better rounded education. 2. Marcus Mariota vs. Jameis Winston as the higher pick. If any NFL team picks Winston ahead of Mariota, it will get what it deserves, and that is probably not a good thing. The things Winston has done to draw question to his maturity, judgment and values are too many to mention. It’s funny that Winston should mention Peyton Manning. Like Mariota and Winston this year, in the 1998 draft, there was debate over which of two quarterbacks would go first — Peyton Manning or Ryan Leaf. Manning, like Mariota, came out of college with exemplary character. Leaf, like Winston — not so much. The Colts took Manning with the first pick, and like the Energizer Bunny, he’s still going. Leaf had behavior problems — four years, four different teams and gone. But even if you want to forget all of that and believe that Winston is the better choice because he’s a more accurate passer, there is the issue that Mariota threw for 42 touchdowns against four picks in 2014 while Winston hit paydirt only 25 times while finding receivers wearing the wrong colored jerseys 18 times. But maybe it’s not an accuracy issue, maybe it’s just a judgment issue. And judgment can be taught? Maybe, but claiming to be in the same class as Manning and Brady and claiming that you’re going to win a Super Bowl next year before you even know what team you’re on seems like a bad start. 3. USC # 4? 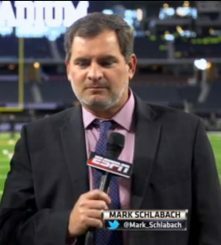 The next time ESPN’s Mark Schlabach has occasion to introduce his wife, I hope he can remember her name, because Schlabach, who picked USC as the top Pac-12 team (and #4 in the country) for 2015, obviously has memory issues. 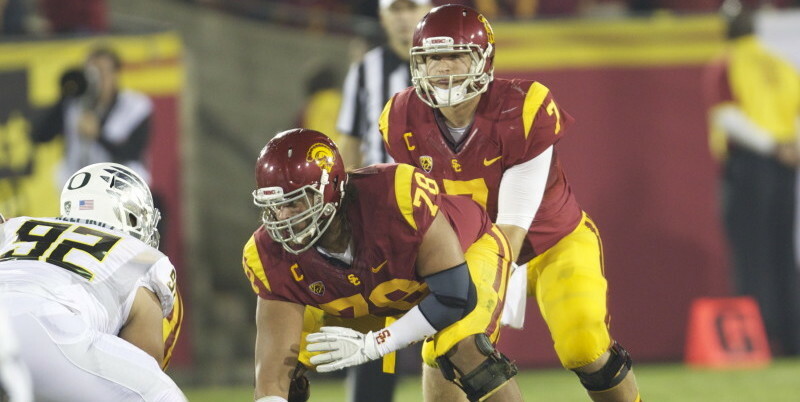 As near as he can remember, Mark Schlabach has USC at #4 for 2015. The Trojans, who always look better on paper than on the field, somehow duped the entire AP Poll in 2012, and were selected #1 in the preseason rankings. True to form, the Trojans finished that year a ho-hum 7-6, which didn’t even come close to cracking the Top 25. And they have Steve Sarkisian as their coach. The smart money that has any memory at all behind it has the Trojans blowing a few games here and there. Sarkisian has yet to prove that he can coach at the highest level, and all those top Trojan recruits have yet to prove that they can build on their high school press clippings.